I took this photo of the studio awning the day it went up, and posted it on social media sites, as well as our newsletter! Despite the small community, few people realized the new studio had opened where the former space had closed. Once the awning went up, the foot traffic in the studio and increased interest doubled. 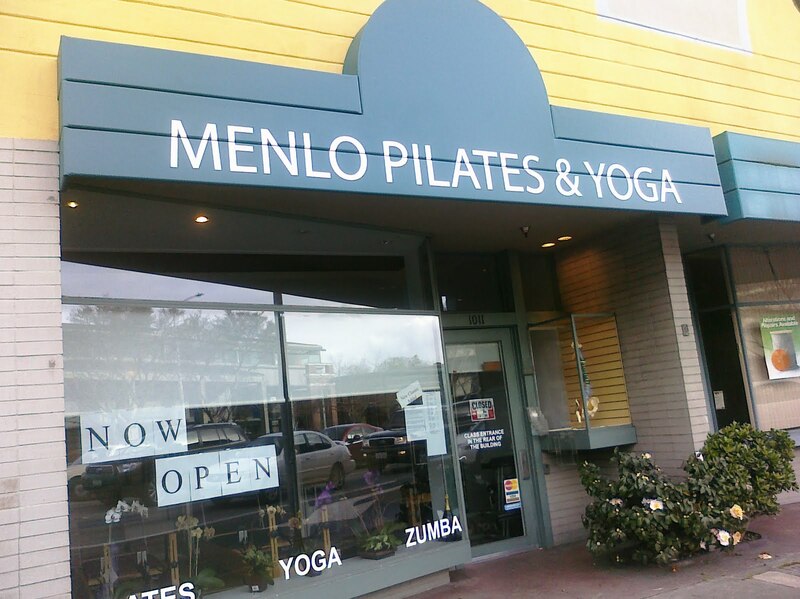 The new yoga studio was in the same location as the former studio that had closed, and had been closed several months in the interim. Therefore, we quickly learned that most of the locals thought it was still closed, despite signs to the contrary in the window, an active newsletter list of over 500, and word of mouth. Ironically, it didn't feel like we were officially "open" until Fran got her new awning! 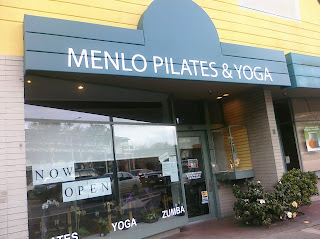 It may sound simplistic, but this gave validity to the space, plus it was visible from the main highway through town, and conveniently located right by the incredibly long traffic light at the intersection, giving people in their cars even longer to checkout not only the awning, but the front window and even a glimpse into the Pilates room. Having the awning up made a huge difference in the number of walk-ins for the studio. I knew the importance of the awning, which is why I photographed it and posted it on the studio's Facebook page the day it went up. Of course, other events quickly followed and played a role in spreading the work about the studio. I was able to obtain 4 media placements, 2 in print newspapers and 2 online. Editors were interested in the local angle of a new business being in town, and I also tailored the press release to highlight the fact that Fran was a busy mother of a ten-year old daughter, and juggled her career and family, making her, in effect, a Mompreneur. I had actually forgotten about that term for a while, when I started meeting people at various events who had read the release and started repeating my own words back to me! Yes, they had remembered that Fran was a mompreneur. There wasn't any more flattering marketing than that. I also framed the press release not only to highlight that the new studio had opened, but that it fit into a local and growing trend of boutique fitness studios, which presented a more personal and intimate fitness experience then the larger health clubs and chains. This gave a further spin to the story. Getting stories about the studio in the local press was important for local branding. Even though there was a natural press interest because of the connections to downtown business, I still had to make the case to editors that there was a deeper story than that. 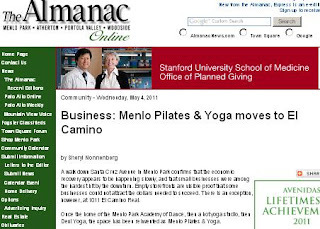 Emphasizing the "mompreneur" status of Fran, as well as the need for stressed out Silicon Valley techies to have a place to unwind, plus the boutique fitness trend, all helped give the story its appeal. Fran had already set up a Facebook Page, but it had very little activity and only about 40 Fans. The profile photo of the empty studio didn't help, and the URL was the original Facebook default, and not a vanity link, making the Page hard to remember. There were also no custom tabs, and no multimedia whatsoever. There were also some other issues. I noticed that there was very little if any posting from the staff, and they were the best representatives of the studio, plus they had their own following of loyal students as well. Further challenges included that surveys of those students who came in, showed very little if no interest in social media, including -- yes -- Twitter and Facebook. Here we were in the middle of Silicon Valley, and, well, no one was interested! Not only that, but the staff at the studio as well were somewhat relectant to embrace social media, although many of them had their own newsletters, and some were on Facebook. I realized at the staff meeting, that I wasn't going to change things over night, and that the best strategy was for me to come up with the best content I could on my own, and try and grow a natural online community by providing incentives, such as giveaways, free classes, how to resources, etc. My strategy was to set up the best framework I could for social interaction, including upgrading the Facebook page big time, and trying to get online conversations and community started. Many of the teachers had their own website and photos, so I used some of the content from that to add substance to the Facebook page. Cosmetically, I also: added custom tabs, including an e-news sign up for the newsletter (Constant Contact has a Facebook app for this), a better profile photo that showed one of the teachers doing a dynamic pose, and a Welcome video embedded into the landing page for new visitors to the page, that showed the variety of classes, students having fun, and conveyed the family feeling of the studio, which had been a key aspect of the branding. While many of them had not yet "embraced" Facebook and Twitter, nearly all of them had newsletters or were developing mailings lists. I took advantage of this by encouraging them to link to our promotions and website whenever possible in their mailings. 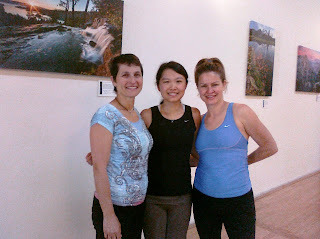 For those who were on Facebook, I posted photos of them and their classes on their Walls, and tagged them to the studio. We also had a staff meeting, where I provided an overview on social media and explained to the staff simple ways they could post online. I also encouraged them to forward and share our Constant Contact e-news. My Facebook strategy was to increase community interaction by posting a variety of resources and media, such as photos, original videos I had created, and asking simple questions to make it easy for people to respond. I noticed that food stories always got some attention, so I started posting more stories about healthy breakfast foods and organics, and they inspired activity and discussion. I also made use of "Skully," the skeleton in the Pilates Room, by making him a character in social media updates who talked about alignment and healthy bones! 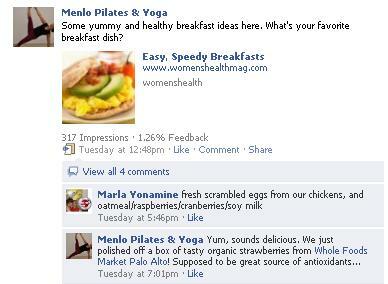 Sprinkling mini contests and promotions Facebook and Twitter, helped promote online engagement. Here, a winner of a free five class pak was chosen at random from the Facebook commenters. Additional winners guessed the answers to fitness trivia questions. Publishing their photos online and in the newsletters also created incentives for contest winners to heighten their involvement, and perhaps even convert to brand ambassadors. While of course not all the students posted, many more did as a result of the promos. They also seemed to really enjoy having their photos taken with their teacher! 3 Marketing Takeaways for Phase 1 of "Yoganomics"
Write and distribute relevant, effective press releases that not only highlight your business, but tie in to local trends and themes. 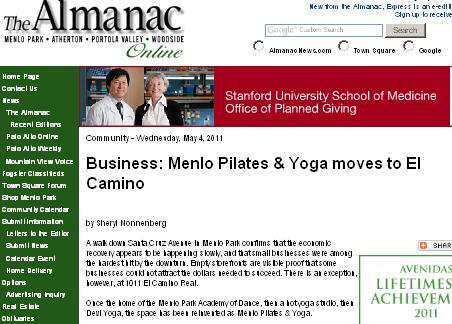 In this case, Fran being a "mompreneur," the studio being part of a new trend in boutique fitness spaces, and an "oasis" in the midst of high tech stressed Silicon Valley-ers, were all key angles that helped us obtain several place placements relatively early on with the local newspapers and online media sites. During the time we were evolving Fran's brand and activities for the studio, I was reading more and more about the importance of brand ambassadors - these are the folks who have known you for a while, feel strongly about your brand and service, and want to tell other people about it. As I observed what was going on at the studio, I noticed that students were gushing about many of our teachers, including Fran and her personal style in Pilates one-on-one sessions. My strategy on this was to capture "brand energy" by encourage these folks to post online to deepend community engagement, which also entered them into a contest to win a free class series. I also created videos highlighting student testimonials, and we increased our incentives with more goodies, including product giveaways, free sessions, and discounts on packages. Fran had previously set up an e-newsletter, a Facebook page, and a website. But everything seemed disconnected, with no real integration among the elements. In order to enhance and deepen what was already set up, I built out the Facebook Page by creating a lot of multimedia content (photos and videos), setting up the vanity URL so it would be easier for people to remember, and making the profile photo a dynamic teacher photo, rather than the studio photo of an empty room. I also started regular posting of entertaining and educational photos, videos, and other resources, plus I started posting on the Walls of some of the local businesses to heighten our online presence. I also knew the importance of having a sense of humor once in a while, so I started posting how I would get a photo of me standing on my head when we reached 100 Fans! I really respect mompreneurs. Managing their business as well as taking good care of their families is not easy at all. I so agree, Valerie, thanks for your comment!